You are here: Home / Education / Adventures in Plastering! Thanks to a flurry of activity at the Edge Hill Service Station last week, the on-going restoration efforts for the 1930s Texaco station are building momentum! 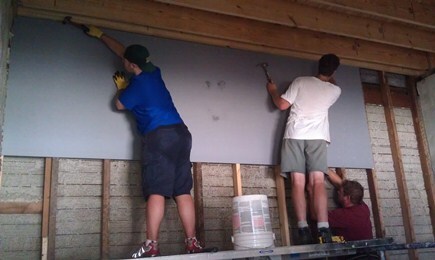 The Fairfield Foundation, in partnership with Adventures in Preservation (http://adventuresinpreservation.org/), held an extremely successful plaster workshop from August 27-August 31, with the goal of repairing some of the interior station walls. 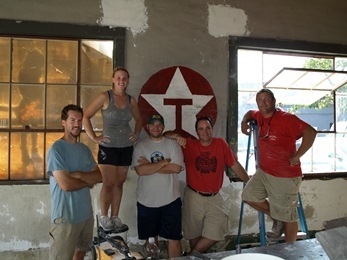 Under the tutelage of Gus Rhodes (GSR Drywall), the workshop crew and dedicated volunteers completed a number of important plaster-related restoration efforts, helping the station look better than ever before! 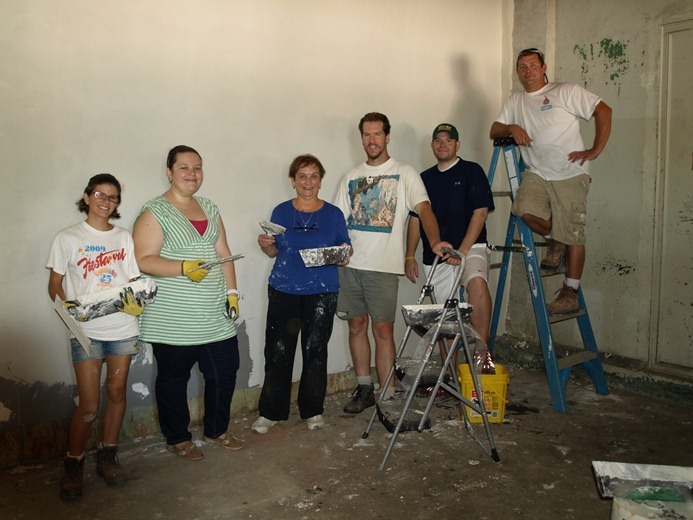 The week went quickly, but we all learned a lot about different types of plaster repair, and were able to put our new skills to work restoring the station. In the west back room, we trimmed, scraped, and cleaned old layers of paint and metal lathe before covering the north wall with plaster board and skimming coats of plaster on top to finish it off. 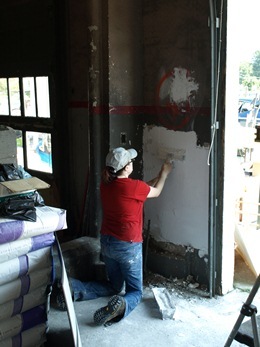 Along the entire west wall of the station, we continued the process of scraping old paint, trimming and patching metal lathe, and covering the necessary areas with – you guessed it – more coats of plaster. In addition to patching various holes in the old plaster throughout the garage bays and two back rooms, we accomplished the significant task of filling in the two large square holes in the wall between the center garage bay and the future “office” area, putting in additional support studs before again utilizing sections of plaster board followed by skim coats of plaster. Progress was also made in the center back room, where we applied coats of plaster beneath the tire storage racks and prepped the area above the tire storage racks with plaster board. The workshop owes much of its success to the generous donation of significant plaster supplies contributed by Master of Plaster Finishing Systems, Inc. (http://www.masterofplaster.com/). Serving as the major preservation task of the station’s interior for 2012, the success of the workshop brings us one large step closer to completing our restoration of the station. But plastering isn’t the only thing happening right now – volunteers are also currently working to carefully restore the station’s original light fixtures. Rick Andrews and Bayside Joinery of Mathews have taken on the daunting challenge of restoring the old east garage door by painstakingly replicating the bottom panel, and making the door look as good as new (er…old).They are also working on a replacement door for the west garage bay that will look like a garage door but function as a conventional door, providing more secure and efficient access into the station. Meanwhile, Howard Fields at Ashland Machinery has been a huge asset in fashioning custom-built window hardware to replace missing elements, as well as repairing the track and life mechanism to the east garage bay door, so that soon we will be able to open the doors wide again. Volunteer work days continue at the station on occasional weekday afternoons, so feel free to email us at Fairfield@inna.net if you still want to get involved, or if you think your company can help us reach our goals of saving this landmark! 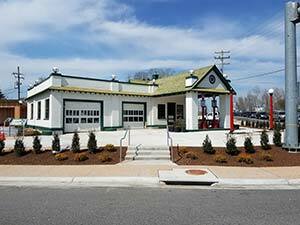 We look forward to working with you and bringing the Edge Hill Service Station back to life as a regional preservation center. Looks like an awesome project! Love the effort that you put into it!